DELICIOUS!! I love grilling season. Yes, boo! :( I miss the smell of grilling too.. Indoor grills are okay, but not as much fun! Um, yes please. This looks summery and delicious. The cleanliness of your grill is shaming me. Shaming me hard. More green that I am liking over here today! Everything looks grillicious. Looks delish! I love grilling! YUMMMM lovin those sweet potato fries!!! Love grilling in the summer time! 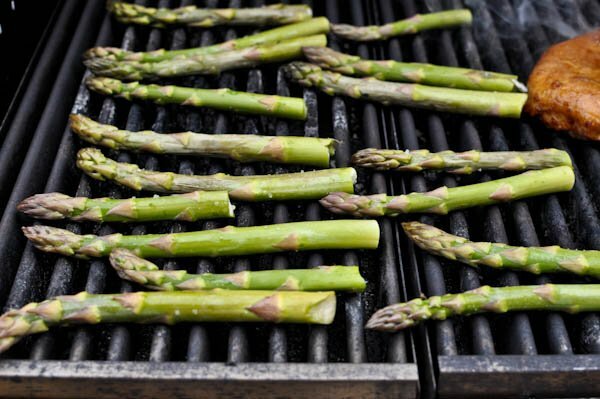 Grilled asparagus is the best! Gotta love the Spring. Yay, so nice and appetizing. Woo hoo! Grilling season is heeeeere! I want your grilled asparagus and sweet tater sticks. PERFECT! Nothing better than grilling out. Sounds great! I am so jealous — I love eating a meal off the grill! yay! we grilled salmon..so happy! Wow!!!! That looks awesome! What did you marinate those chicken breasts in? They look amazing!!!!!!!! Def. trying this!!! Thank you!!! It’s just as delicious on steak and shrimp too! How long do you suggest marinating it for? Overnight is best, but yesterday I marinated it for about 5 hours and it was delish! I did 4 hours in the fridge, then left it out for one hour before marinating to take the chill off. I swear it makes the chicken more tender. Now i’m totally hungry!!! LOL! Thanks for the tips! P.S. LOVE your blog! I also live in Pgh, just about 20 mins north in Cranberry Twp! I want a big, beautiful grill! We have a tiny hibachi, which gets the job done… but really. 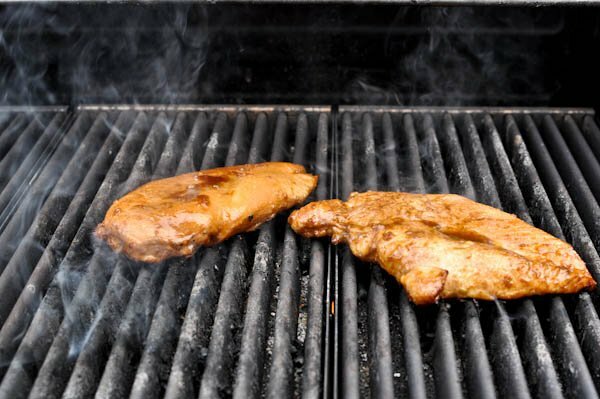 There’s nothing like the aroma & taste of a grilled meal to get you in the summer spirit :). I LOVE sweet potato fries on the grill, but cutting up the taters is SO hard. ok maybe not SO hard, but hard enough. Do you use a special tool? Oh I know! Totally agree. I just use a massive knife. And cry because it hurts my wrist. I’m having dinner at your place – yum! OOhhh, I got asparagus for supper for us too. Bit chilly here in England so we’ll be doing it indoors, I’m going to make some spicy chicken and rice and have them on the side. Yours look delicious going on the grill, enjoy enjoy enjoy. Summer grillin’ is the BEST! Mmmm, I can’t wait to start BBQing!!! I made Trader Joe’s Seasoned Lamb chops on the grill today along with some grilled corn and boiled TJ’s teeny tiny potatoes. OH YUM!